Tires come in various shapes, sizes, treads, and even colors. Choosing a tire usually comes down to your riding style, aesthetic choice, and sometimes cost. This section will show how to change a tire and fix a flat. 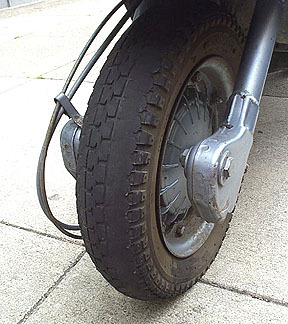 Basically all old scooter rims are split rims and require an inner tube inside even if the tire is printed as tubeless. While it make seem like a pain to have to add a tube to a "tubeless" tire the beauty of the system is evident if you have to change the tube or the tire itself. Not only does it allow you to get the tire off the rim without special tools, but you can also replace the tube without removing the tire from the rim. Tires need to be changed when the tread becomes uneven or worn down to a smooth surface. The groove between the tire treads is there to allow water to be moved out of the way when it is wet. In theory a slick tire will actually hold better in the dry but the treads are absolutely necessary for wet riding, and slicks are illegal for street use. Below is a shot of a tire in desperate need of changing.